I'm back again...a miracle, three posts in such a short time. Today I have a soup for you. Some people only eat soup in the winter but I think they are good for all year long. I like to make soup on the weekend and then eat it throughout the week. Sometimes I even eat it for breakfast. It's nice to have it cooked and in the fridge for a dinner that takes only a few minutes to heat up. If you are struggling with how to eat more vegetables soup is an easy solution. Lately I've been making pureed soups that are smooth and creamy. I bought a butternut squash weeks ago and fortunately a hard winter squash will stay good for a long time if stored in a cool location. I decided to make soup rather than roast it which was the original plan. 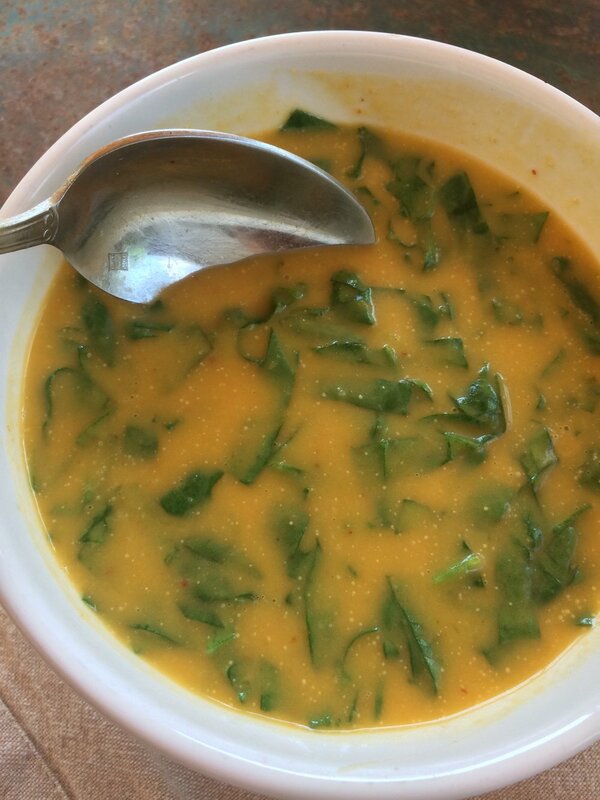 This soup is flavored with Thai curry paste, ginger, garlic, lime and coconut milk. Spinach is added after the puree for some nice texture and added nutrition. You can buy the Thai curry paste in a jar in the Asian section of any large grocery store. Be forewarned most have some sort of fish sauce or shrimp paste so they are not vegetarian. Just read the label and make sure you are comfortable with the ingredients. I loved this soup. It is tart with lime, a little spicy from the curry, creamy and sweet from the coconut milk. It's a keeper. (The dots in the soup above I think are little bits of the coconut milk that solidified because this cooled before I took the photo. Sorry about that!) This makes quite a bit. I think I ate it 6 times but I never got tired of it. 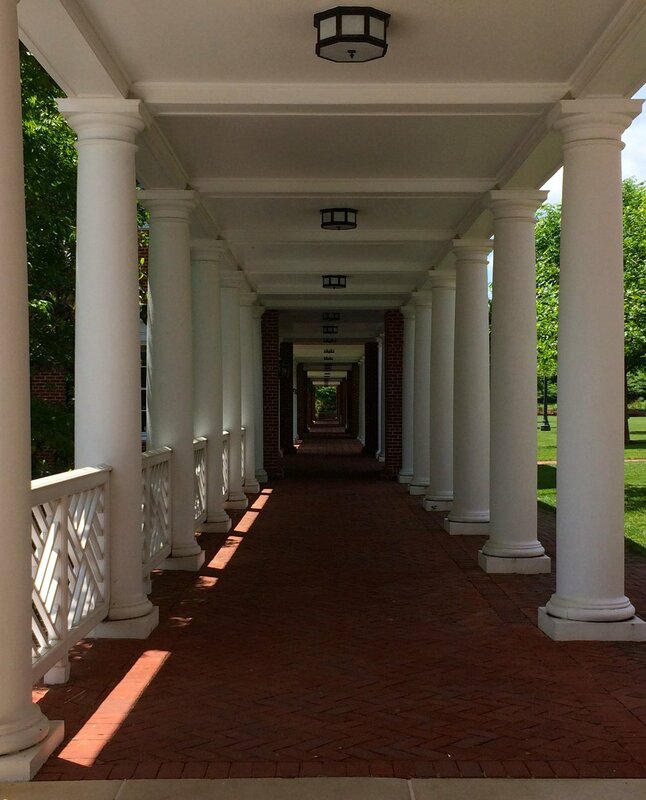 I went to a class at the Darden School of Business at the University of Virginia last week. Darden is the graduate business school and in addition to their Master's programs, they have an executive education program. I took Project Management for Executives and I can honestly say this is the best class I have ever taken. I was a little awestruck with the professor. She is from Israel, educated at the London School of Economics and the London Business School. She was brilliant, articulate, funny, practical, and very approachable, all with great style. An excellent role model, and a great teacher. I loved being there and came home quite inspired with all I learned. 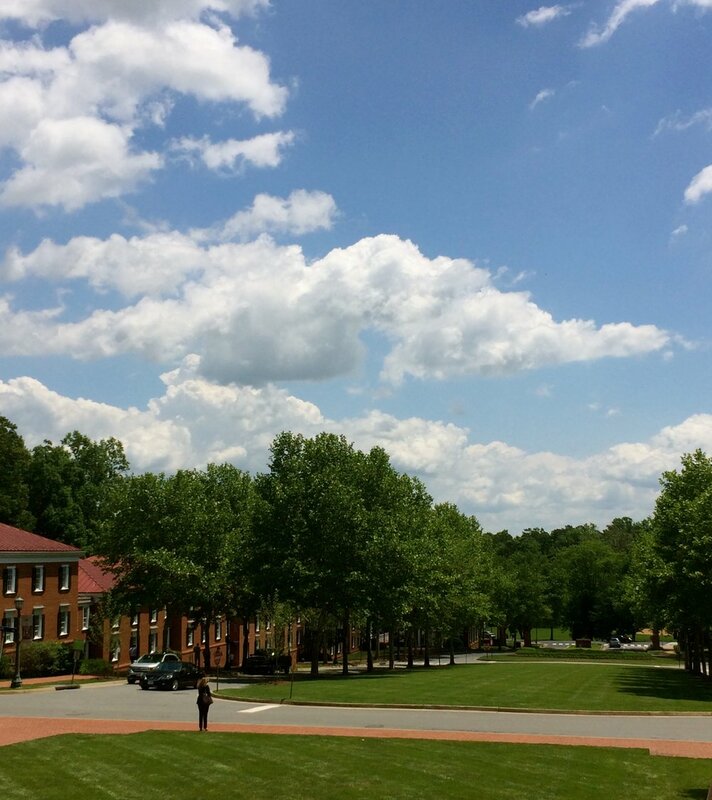 Although the buildings within the North Grounds (the Law School, Darden, and an Inn are located there) are modern, they fit right in with the feel and architecture of the historic buildings at the University. It was a beautiful setting. So that is really all for today. I spent part of the weekend with some family who was in town for a tennis tournament. We had such a great time, and it just reinforced why I love living here. We spent lots of time dodging rain storms but it was fun. Have a great week.....I hope you'll try the soup! Heat the oil in a large soup pot on medium heat. Add the onion and salt, and cook for about 10 minutes until softened, stirring occasionally. Add the curry paste, garlic, and ginger. Cook while stirring about 2 minutes, until fragrant. Add the squash and water and stir well to combine. Bring to a boil, reduce heat to low, cover, and cook for about 20 minutes until the squash is very soft. While squash is cooking, zest and then juice the lime. 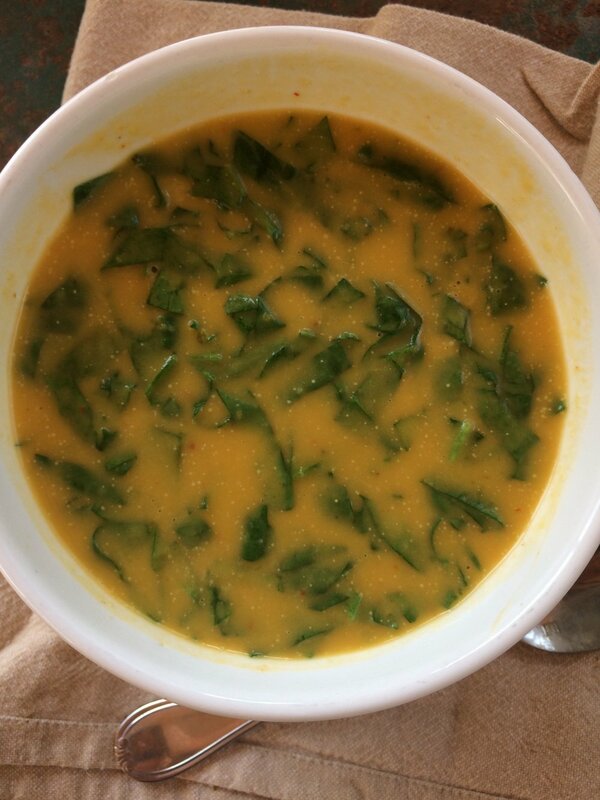 When the squash is tender, stir in the coconut milk, the lime zest and the lime juice. Blend with an immersion blender, or in batches in a blender. Taste and adjust seasoning adding more salt, lime juice, or curry paste as needed. Over low heat, add the spinach and cook about 5 minutes until the spinach is tender. Do not boil or the coconut milk will separate and the soup will look curdled or grainy.